Vintage Men's Rolex Submariner 1680 5512 5513 Faded Black Insert Tritium #A9. BLACK BEZEL INSERT STAINLESS STEEL. Series: Mens Stainless Mens Rolex Submariner. Diameter: Inside 30.25mm, Outside 36.48mm. There are some scratches on insert. Please look at close-up pictures for its condition. 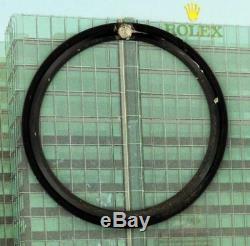 This is a genuine Rolex Submariner bezel. 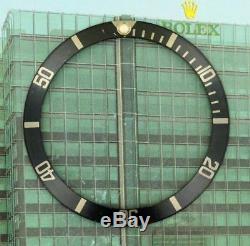 Will fit all Rolex Submariner with Date: 1680, 5512, 5513. We also custom make all color of dial with any color stone that you have in mind. We can make exactly the way that you want it. Watchman Space is not a Rolex dealer and has no affiliation with Rolex Watch USA or Rolex SA. All custom dials are considered after-market unless bought from an Authorized Rolex dealer. Get images that make Supersized seem small. Tailor your auctions with Auctiva's. The item "Vintage Men's Rolex Submariner 1680 5512 5513 Faded Black Insert Tritium #A9" is in sale since Thursday, June 7, 2018. This item is in the category "Jewelry & Watches\Watches, Parts & Accessories\Parts, Tools & Guides\Watches for Parts".